A charming mix of drama and comedy that often hides a melancholy centre, Burn Burn Burn is a deceptively sincere meditation on the nature of regret and the emotional toll it can take. Dan regrets the life he’ll no longer live and what he perceives as the mistakes he’s made with his mother (Asher). Seph regrets the choices she’s made both professionally (she works as a nanny for a therapist who consults from home) and personally (her relationship with James). And Alex has regrets over a childhood incident that causes her to push people away. It’s no wonder that they all became friends: how could they not when they’re such kindred spirits? The beauty of Charlie Covell’s nimble screenplay is that Dan uses his regrets as a way of challenging Seph and Alex to examine and overcome their own problems, and as the journey progresses from location to location, so Seph and Alex confront and overcome the things that are holding them back. There’s a welcome lack of empty sentimentality, and none of the cloying mawkishness that might ordinarily come with a movie such as this, and Button, making her first feature, keeps a tight control over the emotional dilemmas and resolutions that the screenplay delivers with aplomb. The movie also offers up several surprising scenes that seem out of place at first, but which on closer inspection, relate closely to the characters and their predicaments. Alex makes a startling confession while tied to a cross (she’s standing in for an AWOL am-dram Jesus), while an overnight stay at a commune headed by counter-culture philosopher Adam (Rhind-Tutt) sees the pair part of a group gazing at the stars and determining what’s important in life. Moments such as these add appreciable depth and no small amount of artless candour to the narrative, and help make the characters’ problems relatable. 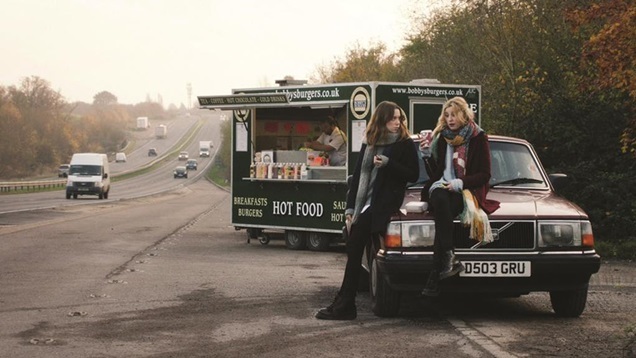 As the troubled pair, Carmichael and Pirrie both provide astute, sympathetic, and likeable performances, and there’s fine work from Farthing that roots around in the despair of dying too young with a frankness that’s often unsettling to watch. The rest of the cast looks like a who’s who of acceptable British cameo providers, and Lowe aside (who’s once again asked to play the same character she normally plays, just in a medieval costume), they acquit themselves well, offering deft touches and character beats that flesh out their roles. Their portrayals are all in service to a movie that eschews the usual quirky road trip analogies, and which centres instead on telling its heartfelt story with quiet verve and incisiveness. 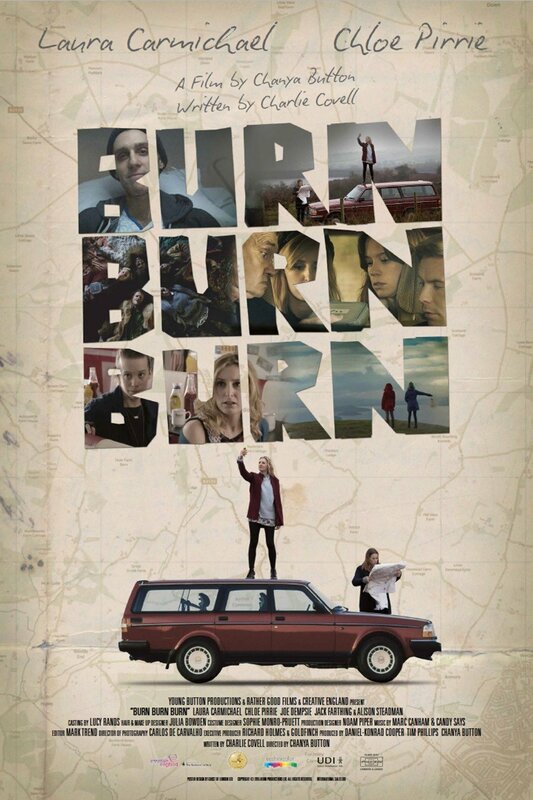 Rating: 8/10 – a winning blend of honest drama and good-natured comedy, Burn Burn Burn is a modest yet effective first outing from Button that is a pleasant and rewarding alternative to the huge number of similar movies that are out there; brimming with confidence, and unafraid to tackle some difficult topics head on, it’s bolstered by a moving score and soundtrack courtesy of Marc Canham and the indie band Candy Says, and leaves you wanting to know just how Seph and Alex get on once their trip is over.